You can use Data Loaders Add or Update Order option to add orders, update orders, or do both at once. Adding orders using Data Loader allows you to directly import order data without needing to configure commerce settings in the platform. Once the Data Loader import is configured, order data is added or updated every time a file matching the import settings is found on the FTP server when the import is run. You can use a delimiter to offset each line item in your file and specify which delimiter was used in Data Loader. When you import a file, its contents are compared to existing data in Bronto. If a new record matches an existing record, Bronto will overwrite the existing record. This means if you import an update to a record that includes blank/null fields then the data stored in Bronto for the fields will be blank and/or null after the import. However, when you import contact data you can set Bronto to ignore blank and null data so existing contact data is not overwritten. Once the import has run, you can go to Commerce > Orders to view your orders or changes to your orders. For more information see Orders Page. Go to Settings > Data Loader. Enter the relevant information in the Create Import Job window. Enter a name for the import in the Name box. Enter a description for the import in the Description box. The description is a good way to distinguish between similar imports. Select Add or Update Orders from the Type list. Click Upload Sample File To Begin Mapping to map the categories in your file to fields in Bronto. This let's Bronto know how to appropriately manage your order data as it is imported. In the Upload Sample File window, select the delimiter used in your file from the Delimiter list. In the Upload Sample File window, select Upload a file. Select your file from the Files list. If the file upload is successful, the mapping page will be displayed. This does not upload the file to the FTP server or import the data into Bronto. You will still need to complete a file transfer and configure your import for that to occur. In the Upload Sample File window, select Select one of the files in your account. Click Choose File, select your file in the finder window, then click Open. If the file upload is successful, the mapping page will be displayed. Select the Bronto order field from the Map to list that matches the data shown for the column. Mapping helps the platform understand how to manage data as it is imported. 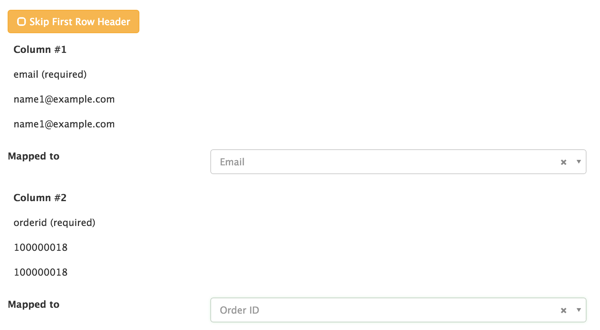 For example, in the image below you would select Email Address for Column #1 and Order ID for Column #2. This way, when your email addresses are imported they are formatted like an email address, etc. The available Bronto order fields are set; you cannot create new order fields. For more information about available order fields see Order Fields / Order Details. Select Yes or No in the Skip First Row Header list. Select 30 days or 3 days from the Cleanup Schedule list. This determines if you want the files to persist on our servers for the minimum of 3 days or the maximum of 30 days. Ends with will match files based on the extension specified for the Filename Matching Pattern. Only use Ends with when this your only import that uses this file type and you are only submitting one type of file for this import. If you have multiple Data Loader import jobs and want the file extension taken into consideration, Custom Glob is the best choice. Starts with will match files based on the characters specified for the Filename Matching Pattern starting with the first character. For example, if you have contact for the Filename Matching Pattern then all files on the FTP server that start with the word contact will attempt to be imported. Custom Glob will match files based on the characters and the extension specified for the Filename Matching Pattern. This allows you to use wildcards in order to build more complex import queries. Enter a full or partial filename in the Filename Matching Pattern box. This is used in conjunction with the Filename Matching Scheme to recognize what files on the FTP server should be imported using this import job. If you use the Custom Glob option for Filename Matching Scheme you can use wildcards. Make sure the information you include here is specific enough that the import job won't attempt to import files on your FTP server location that are intended for other import jobs you may have configured. But also keep the filename general enough that the import will be able to import multiple files with slightly different names if your import requires using multiple files. If you want to receive an email notification when your imports complete, enter an email address in the Confirmation Email box. The notification email contains high-level information about the import and includes a link to download a run log that contains any errors the import may have. Select a delimiter from the Delimiter list. If you plan to import date-based data, click the calendar icon under Date Format and fill in the options in the Date Format Builder window. You must map a date-based field before you can configure Date Format. In the Date Format Builder, select a date from the Example Date & Time list, click Go, then click on each number in the date to select whether it is a Day, Month, or Year, and then click Done. Select a default shipping status to apply to orders during the import from the Default Shipping Status list. This is only applied to orders where the shipping status is not provided. The default is Not Shipped, but you can change this to Shipped. Select an order status to apply to orders during the import from the Default Order Status list. This is only applied to orders where the order status is not provided. Pending orders are orders that have not been completed and Processed orders have been completed. If you want workflows that are triggered by the Order Is Added or Order Is Shipped trigger nodes to recognize and trigger on changes to order and shipping statuses made by the import, set Trigger Workflows on Status Update to Yes. When set to No, imported orders with a change to either the shipping status or the order status will not trigger these workflows even if the status change typically would. Select a currency type from the Default Currency list. The currency should match the currency you have set for your Bronto account. In the Bronto Settings area, enter the list name in the Add Contacts to Specified Lists box if you want to add contacts to a list as they are imported. When you have finished import configuration, click Save & Close. A window that asks you to confirm that you understand and have correctly configured whether your orders should be imported as pending or processed. Select the I Agree box. If you haven't already, Transfer Your Files to the FTP Server. Find the import you just configured and Perform a Test Run to ensure that the files are valid. Based on the results of the test run, fix any issues as necessary. After the import has run, you can Data Loader Reports to see details about your import. You can construct a JSON object and add it to your site in order to use Order Service with Cart Recovery to pass cart and order data to Bronto. An account must use Order Service in order to use several of Bronto's new features. If your account uses Legacy Conversion Tracking, then it does not use Order Service and will need to be migrated. Order settings define how order data is stored in Bronto.